The long awaited release of Superior Drummer 3 by Toontrack is finally here. Toontrack describe this latest version of Superior Drummer as "The complete drum production studio. ", we agree - it's amazing. As you may or may not know Pro Tools Expert were given early access to the Toontrack Superior Drummer 3 software. Watch our videos below to learn of SD3's new features including UI Resizing, New Mixer with Built-in Effects, Marcos and drum hit replacement in Tracker. What Is Superior Drummer 3? This new version of Superior Drummer includes at least 14 new features. Recorded at Galaxy Studios, described as probably the world’s quietest and ideal location for sampling, the core sound library boasts in excess of 230 GB of raw sound material captured in immersive 11:1 audio by award-winning engineer George Massenburg. As of today Superior Drummer 2, the previous version, has been discontinued and is no longer sold online. The Superior Drummer 3 software will be delivered as a download, available at the Toontrack website and in the Toontrack Product Manager directly upon purchase or registration, regardless of whether the product is obtained from Toontrack’s web shop or from a third party retailer. The full Superior Drummer 3 core sound library content can be downloaded in convenient parts through the Toontrack Product Manager. At an additional cost, there is also an option of getting the full sound library pre-installed on an SSD hard drive and having it shipped directly to you. All versions of Superior Drummer 3 feature exactly the same software and sound library. The only two things that set the versions apart are pricing and the unique serial number. 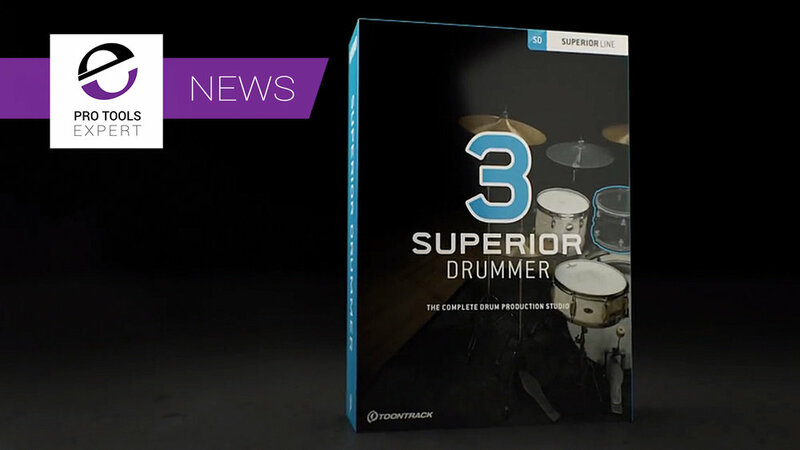 Visit the Toontrack website for more information about Superior Drummer 3 and also our friends at Time+Space for Superior Drummer 3 upgrade and crossgrade information. Watch our first look exclusive video to see a selection of new features in Superior Drummer 3.0 in action such as UI Resizing, New Mixer with Built-in Effects, Marcos and drum hit replacement in Tracker. Over the last month we have been testing Superior Drummer 3 in our workflows and it quickly replaced my "go to" drum library, EZ Drummer 2, in my music production work. The drum replacement Tracker feature has already saved my bacon in a critical mix that had a tragic buzz in the snare drum close mic track, within a minute the snare was replaced and sounded epic. The new mixer encourages me to shape the tone of the drums internally suppose to routing out all the channels to aux tracks in Pro Tools. Routing channels out of EZ Drummer 2 was the way I worked with drum sample libraries... now I can see I am slowly shifting my drum virtual instrument mixing workflow to mixing drums inside the UI using the powerful new internal mixer and effects suite. Watch this free tutorial video to learn how to use Superior Drummer 3's newly improved internal mixer. New features include Macros and a comprehensive effects suite. This tutorial also shows you how to use Superior Drummer 3's Mixer channels, buses, and routing capabilities. Toontrack's new Tracker feature in Superior Drummer 3 is a powerful drum replacement solution that perfectly replaces recorded drums with the samples in SD3 or user samples. In this video for Pro Tools Expert, Technical Editor and Drummer James Ivey test the Tracker feature in Superior Drummer 3.0. James shows you how quick, easy and pain-free it is to replace and enhance acoustic drums.